"Destiny has big plans for little Simon Birch." 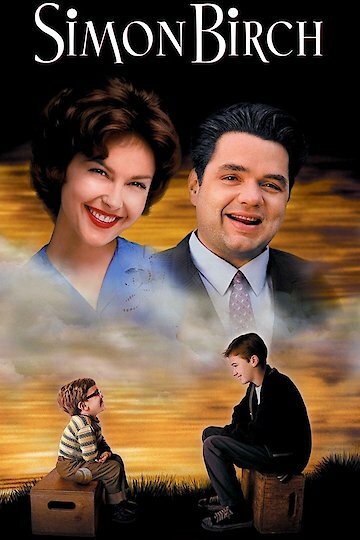 Simon Birch is a dramatic film about a young man who has a growth problem, causing him to be permanently small. Even though Simon has a growth problem, he believes that God has a plan for his life and that he was put on Earth for a reason. The film is based on the novel A Prayer For Owen Meany by John Irving. Simon meets Joe, who is the illegitimate offspring of a woman in his town. Simon and Joe are so used to feeling different from other people that they instantly bond and begin a lifelong friendship. Simon and Joe decide that they need to go on a trip to find who Joe’s biological father is. Joe’s mother has been trying to keep the identity a secret from Joe his entire life. Joe’s mother is more concerned with beginning a relationship with a new man named Ben. Joe doesn’t like Ben at first, but he begins to see how happy Ben makes his mother, so he learns to like him. Simon is the most spiritual and faithful of the two boys, and Joe begins to learn positivity from him. Even though many of the people in the town make fun of Simon, he is firm in his belief that God has a purpose for him and will not let anyone change his mind. Tragedy strikes when, in a horrible accident, Simon kills Joe’s mother. Simon is devastated by what happened but the tragedy ends up bringing him and Joe closer together. Simon ends up sacrificing his life at the end when he saves a busload of children. Ben then decides to adopt Joe, so Joe ends up with a stable father figure after all. Much of the focus on the film is about believing in yourself and believing that God has a purpose for you. Simon Birch is currently available to watch and stream, buy on demand at Amazon, Vudu, Google Play, iTunes, YouTube VOD online.